Intel wants to match PC battery life with that of tablets through its new dual-core fourth-generation Core processors code-named Haswell. The chip maker announced Tuesday the new dual-core Core processors for tablets, laptops or “2-in-1” ultrabooks with dual laptop-tablet functionality. Intel intends to reduce the chip power draw to as little as 6 watts, paving the way for Haswell devices that could be fanless and offer the longer battery life found in many tablets today in certain use cases. Dual-core Haswell in all its glory. The new dual-core chips, announced at the Computex trade show in Taiwan, follow Intel’s launch of Haswell quad-core laptop and desktops chips earlier this month. 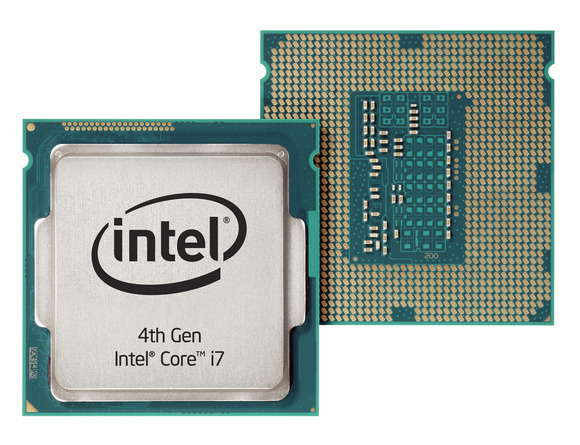 Haswell was designed with laptops and tablets in mind, and the reduced power consumption does not hurt performance, said Dan Bingham, marketing manager of Intel’s PC Client Group. Previously, Intel aimed for power draw of 7 watts, and is now looking to lower the number beyond 6 watts, Bingham said. Depending on usage, laptops and hybrids with Haswell dual-core chips will offer up to 50 percent more battery life compared to previous Core chips code-named Ivy Bridge, Intel has claimed. Laptops will offer battery life of six hours or more when watching high-definition video, according to Intel’s estimates. In idle or standby mode, the chips will extend battery life by up to 20 times. The improvements are vital for Intel as PCs are falling out of favor as users move to smartphones and tablets. Intel wants to bridge the laptop-tablet divide with Haswell with longer battery life and optional detachable touchscreens and keyboards. At Computex, PC makers are expected to show laptops and hybrid devices with screens that detach or fold back to make a tablet. Dell has said its XPS 12 hybrid with Haswell chips will offer nine hours of battery life, compared to six hours of battery life with Ivy Bridge chips, which shipped last year. Ivy Bridge chips drew a minimum of 17 watts of power. The new chips have incremental CPU performance improvements of between 5 and 15 percent. The Haswell laptop processors offer up to two times the graphics performance than predecessors. Depending on the graphics core, Haswell’s laptop chips will support 4K displays, in which images are displayed at a resolution of 3840 x 2160 pixels. The new dual-core chips include the Y-series Core chips, which will draw between 6 watts and 11.5 watts of power and are targeted at 11.6-inch slates and laptops with 11.6-inch detachable screens. The U-series chips will draw between 11.5 watts and 15 watts of power and are aimed at convertible or clamshell laptops with 13.3 inch screens. Many on-chip features, such as consolidation of voltage regulators and improved power management have helped reduce power draw. The chip also has reduced power leakage and enabled faster throughput, which reduces the stress on CPUs. For Intel, improving battery life was the top priority as the company tries to break the dominance of ARM, whose processors are used in most smartphones and tablets, said Nathan Brookwood , principal analyst at Insight 64. “From the very beginning of the [Haswell] development process they had performance-per-watt be a keen design parameter,” Brookwood said. Intel’s new Core processors may in fact compete with its own low-power Atom tablet chip code-named Clover Trail, and later on, Silvermont, a more power-efficient Atom chip due later this year. “They need that to compete with ARM or even Clover Trail products,” Brookwood said. The 6-watt measure comes from what Intel calls SDP (Scenario Design Power), which measures usage of power to dissipate heat in specific usage scenarios such as mobile or touch applications. That differs from the regular measure of the universally accepted TDP (Thermal Design Power), which Intel says may not apply in the case of devices like tablets, which have a fundamentally different design compared to regular laptops. However, companies like Advanced Micro Devices have contested the SDP measurement, saying the TDP was the best way to measure heat dissipation. Intel officially announced two U-series chips that draw 15 watts of power. The Core i7-4650U runs at a clock speed of 2.9GHz to 3.3GHz, has 4MB or cache and is priced at US$454 for 1,000 units. The $342 Core i5-4350U runs at 2.6GHz to 2.9GHz and has 3MB of cache. Intel officials did not say when Y-series chips would be released, but said 19 U-series chips would be released this year. Updated at 10:22 a.m. PT to include a video report from IDG News Service.